India vs Australia 3rd Test Melbourne: It was a lethal bouncer by Jasprit Bumrah at the stroke of Day 2 that Marcus Harris took his eyes off the ball and it hit him on his helmet. India vs Australia 3rd Test Melbourne: It was a lethal bouncer by Jasprit Bumrah at the stroke of Day 2 that Marcus Harris took his eyes off the ball and it hit him on his helmet. 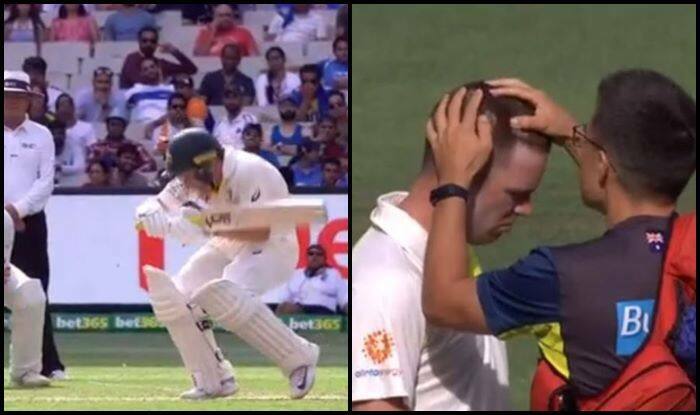 The batsman was cleared of any injury but he immediately was given a new helmet as his helmet cushioned the blow. Once he was hit, every player gathered around him to see if everything was okay. Meanwhile, Australia has not lost a wicket at stumps on Day 2, the two Australian openers Aaron Finch and Marcus Harris managed to survive. Meanwhile, Kohli missed out on his 26th ton by 18 runs, but he surpassed Rahul Dravid to register the most runs in overseas Tests as an Indian n a calendar year.